There are very few holiday destinations that satisfy all types of travelers. Tioman Island located in the state of Pahang some 32 km off the east coast of Peninsular Malaysia is a holiday destination that enamors luxury travelers, touring travelers, adventure travelers and peer group travelers. 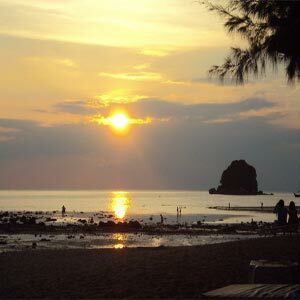 Tioman Island is suitable for couples, families, and corporate executives looking to blend business with pleasure. Check the sights and sounds of Tioman Island waiting to be explored and experienced. Plan your visit to Tioman Island, draft a personalized Tioman island itinerary with our tourist guide. Find how to reach Tioman Island, accommodation facilities available, the must-see places and activities that attract tourists from across the globe. Some tourists enjoy and look forward to be part of the tourist season. June to August is high tourist season in Tioman Island. Some tourists like their holiday spots sans the usual hustle of tourists. If so, the best time to visit Tioman Island is between the months of November to February, the monsoon season when the island is almost deserted. Most resorts are closed during these months and re-open from Chinese New Year onwards. The resorts that function during the monsoon season offer reduced rates. You will experience plenty of rain, rough seas, limited ferry services and visiting the seashore becomes almost impossible due to which tourists cannot indulge in any water activities. Average temperatures range between 28ÂºC up to 30ÂºC, with 85 % humidity. Rains may lash any time during the year. Taking tropical climate condition into account, the best time to visit is between March and October, when the weather is favorable. The water temperature is most suited for many water related activities, particularly swimming and scuba diving. Getting to Malaysia is easy. Major airlines of the world service the Kuala Lumpur International Airport. From Malaysia, you have two options to reach Tioman Island, fly or take a two-hour boat ride. Remember that ferries do not depart on a regular basis and are dependent on tide levels. Here are options for consideration. Fly by Berjaya Air (daily service) from Kuala Lumpur, 1-hour ride, 1 way. Fly by Berjaya Air (daily service) from Singapore. Travel by bus from Kuala Lumpur or Singapore. Get to Mersing, take a boat to Tekek Village, Tioman that takes about 1 to 2 hours. Avail services of travel package operators like discovery tours and travels, Singapore. High-speed catamaran service between Singapore and Tioman. Travel duration is roughly four to five hours. Fast ferry services are available from both Mersing and Singapore. Budget accommodation to luxurious class, there are three star hotels, budget hotels, affordable resorts, luxury resorts on private beaches, stylish villas, chalets and eco-friendly boutique resorts on private beaches. If you love the sea and want to spend more time in the sea, think of Live on Board option. Depending on length of stay, your interests, the facilities and amenities you are looking for, choose accommodation that suits individual budget. There are hotels very near the airport and hotels in remote locations too. Resorts in Tioman Island have a golf course, gym, and sauna facilities. Almost all hotels in Tioman Islands offer spectacular view of the stunning beaches. Likewise, one can recline on the hammock, relax and enjoy breathtaking view of the sunrise and sunset from the comforts of place of stay. Just with a mouse click through the Internet, you can reserve accommodation in any hotel in Tioman Island. According to legend, this island is the final resting place of a mythical dragon princess. Till today, the island bears a startling resemblance to a sleeping dragon. Tioman Island is part of the Tioman Marine Park, which comprises a cluster of islands gazetted as a Marine Park in 1995. Tioman Island is the largest of 64 volcanic islands. Flora and fauna of Tioman Island have been featured in National Geographic documentaries. The Island is relatively small, measuring 39 km long and 12 km wide with its highest peak at 1047 meters. There are eight main villages, the largest and most populous being Kampung Tekek in the north. Tioman was declared a duty-free island in September 2002. Sightings of a local inhabitant, the monitor lizards are quite common in Tioman Island. Local population on the island mainly comprises Muslim Malays. The natural beauty of the Island is its biggest attraction. Imagine miles and miles of white sandy beaches, lush tropical forests, mountainous jungle, air filled with tranquility, the soft sound of swaying palm trees, friendly locals, spectacular marine life, enchanting coral gardens and abundant virgin scenic beauty. The Island is home to 141 bird species and 45 species of mammals. Tioman Island is rightly termed as an enchanting holiday destination. Tioman Island has many exciting activities that enthrall visitors such as island tours, scuba diving, fish viewing, fishing, beach and water sports, snorkeling, rock climbing, jungle trekking, golfing, spa treatments, cruising in a glass-bottomed boat, wind-surfing and gliding, duty-free shopping etc. The nightlife is awesome. As regards food to tantalize taste buds, Asian and Western cuisine is served alongside Malay staples in many of the hotels and resorts. It is a common sight to see tourists savoring fresh seafood barbeque dinner. Itâ€™s time to go around Tioman Island. Your choice is by sea taxi or trekking. You may also rent bicycles and mopeds in Tekek, for a small tour. Contact tour operators and choose packages that meet your requirements. One-day-island tour typically covers highlights of Tioman in one day. There are no roads on Tioman Island apart from the short stretch between the airport and the Berjaya resort and the jungle road between Tekek and Juara. The only way to reach all attractions is by speedboats and sea buses. Itâ€™s a common sight to see people moving from one village to another by chartering a boat, taking a sea taxi ride, using ferry services or tourists trekking on narrow footpaths. Here is a list of attractions, famous landmarks that should be covered on one-day island tour. Get started by going to Mukut Village, a sleepy little fishing village at the southern tip of the Island. Asah waterfall: It is located outside of Mukut Village. To enjoy the magnificent cascades, tourists take a boat ride from Mukut village and trek through the jungle. Twin peaks: Referred to as the dragonâ€™s horn or the Gunung Nenek Semukut, the twin peaks is the highest peak in Tioman Island. It is popular for rock-climbing activities. A three-day climbing tour is most sought after by adventurous rock-climbers. Renggis Island: It is located right in front of the Berjaya Resort. The shallow calm waters of the Island makes it a preferred destination for snorkeling and scuba diving. At close vicinity, tourists get a chance to spot turtles, black tip shark, Jew fish and plenty of sea urchins. After visiting these places reserve remaining part of the day to engage in duty free shopping in Tekek. There are a number of duty-free shops that sell alcohol, cigarettes, chocolates, perfumes and souvenirs at affordable prices. Also, spend few hours walking along the sandy beaches and donâ€™t miss to wet your feet in crystal clear blue water. One-day Tioman island tour is an itinerary suitable for tourists who visit for a day, a stopgap destination. Tioman Island has much more. For a wholesome, satisfying feeling, a minimum of three days and two nights is required. Island hopping: This could well be the star attraction of the tour. In a day, you will hop from an island to another. The journey provides an opportunity to explore the cultures and unique attractions of various villages. Rawa Island, Gual Island, Mensirip Island, Harimau Island, Tengah Island and Besar Island are covered during Island hopping tour. Fishing trips: There are so many places for reef fishing and deep-sea fishing. There are few small wrecks of wooden fishing boats, which provide a focus for fish life. Pemanggil, Rawa, Hujung, Tengah, Besar, Tinggi, Aurand Sibu are the best fishing spots. There are organized fishing trips that provide fishing equipments like fishing pole. There is another option too. In case, you want to do it all by yourself, befriend a local fisherman who can take you to select fishing spots. Places of historical importance: Besides the Japanese fort and mausoleums of early rulers, a museum in Tekek has maps, old coins, sea charts and objects salvaged from ship wrecks around the Island displayed for tourists viewing. Rock-climbing adventure: The excellent granite formations found around the island are great for rock climbing adventures. The cliff of Gunung Nenek Semukut or Dragon Horns is considered to be the most challenging. International competitions and womenâ€™s record-breaking events are hosted at this site. There are three days or five days rock climbing packages. Not restricted to advanced climbers, even beginners are encouraged to try at any of the other sites or at the base of twin peaks. Scuba diving: Classes are held for students who wish to get diver certification. Itâ€™s the best place for beginners to learn diving. The diving is suitable for all grades of qualified dive. There are twenty different dive sites. Calm water with limited currents, clear water unto 100 feet depth, rich coral reefs, underwater gardens, marine life, ideal water temperature, all contribute to making Tioman Island a favorable place for scuba diving. A close exploration of rich marine life and relics of World War II including two Dutch submarines, British and Japanese ships wait to be explored. Diving equipments are available for rent at diving sites. Best visibility, say 15m to 30m is during the months of March until May and then again from September until November. During the summer months, the visibility usually drops to around 8m to 12m. The Marine Park is a popular diving site. Other popular stretches for diving is at Slang, Tulang and Renggis Island. Snorkeling: To view the magnificent underwater scenery, Snorkeling is a must during a visit to Tioman Island. A favorite snorkeling spot is the Renggis Island and the coral Island. The water is crystal clear and the reef floor is only about 30 feet from the water surface of high tide. Coral of all shapes and sizes, colorful fish of all sorts can be found in this spot. There are times when tourists have spotted stingray, a big sea turtle and other rare fish species. There is the 18-hole international standard golf course at Berjaya Tioman Resort Complex. The view from the golf course is fascinating. Golfers usually describe their golfing experience as one that is filled with challenging hazards with ponds, bunkers etc. Trekking: Jungle trekking is for the adventurous lot. Wander through the lush rainforest of the Island. To unlock the diverse natural beauty of Tioman Island, try a three-hour trek across the Island between Tekek village on the west and Juara village on the East. Walking or trekking, it facilitates exploring inner paths, enjoying the scenic beauty, learning more about flora and fauna and indulging in bird watching for hours together. Avail services of trekking operators or take help from a local guide. Beaches of Tioman Island: The beaches of Tioman Island are rated as one among the top 10 beaches of Malaysia. Beautiful soft and sandy beaches of Tioman Island are a treasure trove of underwater creatures and coral reefs. Walking along the beach during the early morning hours offers fantastic views. The beaches of the island are ideal for a lazy day of lounging and swimming. As the sun goes down, Salang Beach gets ready to host a party by the beach, a place to be, to dance the night away. In contrast, Juara beach is the quietest beach that is located at the east coast. Rounding off Tioman Island trip: Like all good things come to an end, it could well be your last day in Tioman Island. Spend time walking past the paths of Tioman Island that is befittingly complemented as the most spectacular and tranquil places in this part of the globe- a place where tourists yearn to return.